Odds are I started playing Tom Clancy games later than most of you did. It’s not that I didn’t like them or anything, it’s just that I was playing other things at the time and had not gotten around to anything in the franchise until four or five years ago. With the exception of the two Advance Warfighter games that I played at launch, I ended up getting most of what I missed on the Xbox 360 all at once and tore threw them in a marathon session. I really enjoyed all of them. A lot. I really regret not getting them earlier in their life cycles so I could enjoy them with others. Now we have our first new Tom Clancy franchise on the new generation of hardware (or PC, if that’s your thing) and I’m happy to say I’m on board with Tom Clancy’s The Division at the start. This is a crucial thing for a game like The Division, as it is really better suited to be played with others. Sure, you can go it alone in the ruins of New York City, but I don’t recommend it. The challenge scales to how you play, but simply put, it’s better with friends. Or strangers, if you don’t have any friends. Group encounters, be it PvE or PvP, are way more fun with others. The game is set in the ruins of New York City after a deadly smallpox outbreak is unleashed during the Black Friday sales rush. The game does little to set up the plot unless you dig into the deeper fiction via the game’s collectibles, but a spoiler-free summary would be that an unknown party put the virus on cash bills and the rest of the country (maybe world? we don’t really know) all fell into chaos as massive percentages of the population fell prey to the disease. Those that found themselves immune to it are left to pick up the pieces, and your player character is one who works for “The Division”, which is a paramilitary group that is tasked with restoring order in the chaos that ensued after everything fell apart. You pick your way through the city, restoring services like water and power while setting up The Division’s foothold on the city by eliminating various gangs and terror groups who are taking advantage of the disorganized masses. 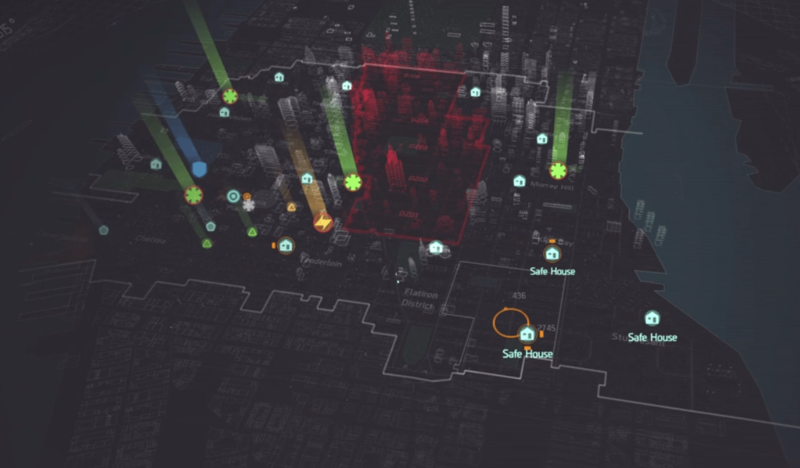 The Game’s Map is a sizeable chunk of NYC, with the Dark zone taking up about a third of the map. The game is primarily a cover-based third person shooter. Anyone familiar with past Tom Clancy games should feel at home right away in terms of control scheme, and with that comes added RPG elements that work well within the confines of the play style. 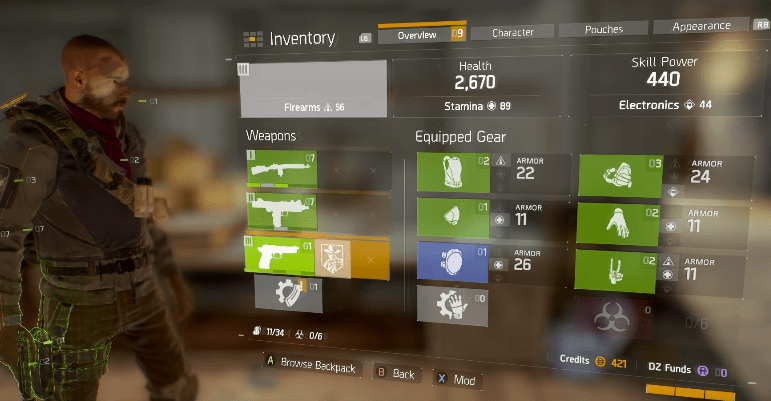 You can upgrade your weapons with mods like scopes and muzzles, as well as swapping them out for higher-rated gear as your character levels up. Skills, Talents, perks, and buffs are placed into three categories that correspond with The Division’s three subdivisions, all which can be leveled up as you slowly work your way through the city’s missions. You’ll augment your weapons with crafted attachments or purchased upgrades, and just about everything can be broken down into component parts and used to make something else later. Missions reward you with loot of all types, including consumables and clothing, which allow you to further customize your agent. The missions themselves can be pretty in-depth if they correspond with the greater story, or terribly simplistic if you are just roaming around and stumble on one. Each can be replayed with a higher difficulty setting, which can potentially offer you better loot rewards too, so replay value is somewhat high in this respect. Every mission can be played alone or with a team of friends, and honestly, they are extremely more fun when played with a group. Since you can only employ a limited number of skills or perks at once, its beneficial to coordinate with others to cover the spectrum of what’s available. For example, my group often had one player using healing perks that can assist all team members simultaneously, while another (me) used offensive perks like deplorable drones and auto-turrets. There’s a lot of variety here, and if you approach each encounter intelligently, your group can really click. I found the most enjoyment when a difficult encounter was suddenly mastered by the group when we all figured out how and when to best use our skills and weaponry to master it. There’s a lot to customize. I found the menu a bit daunting at first because of it. That said, I played a lot of the side missions alone to slowly build up my stats. On top of cash and XP rewards, some missions have resource rewards that correspond to the three wings of your HQ, which need to be updated individually to unlock their respective perks. I focused my solo play on getting these resources, and while I ended up grinding through things for the most part, it was still enjoyable. 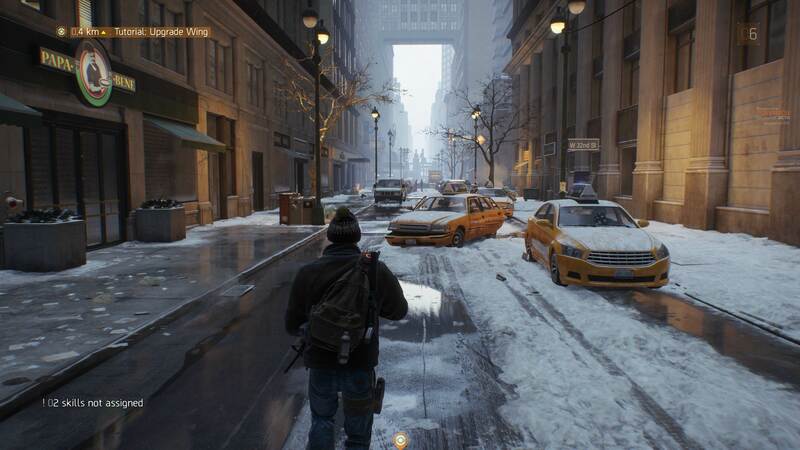 As I discussed in my post about this game’s beta, the city of New York that Ubisoft has created is quite immersive, and provides a fantastic playground for this sort of game. From just a realism standpoint, I can’t recall too many games outside of a Grand Theft Auto title that has made a city feel so lifelike, even in the middle of an apocalyptic event. Everything from graffiti to advertisements seem real and there’s a ton of variance to them. It does not feel like the city is build with any sort of cut-and-paste technique, so landmarks are recognizable and every corner has something else to discover. A decent amount of buildings have rooftops to explore or interiors to enter, and there are areas of the subway and sewer system to venture into as well. All in all, the small section of the city that is available is pretty darn fun to look at, and quite fun to play in. It looks like potential DLC could include other areas of the city to explore in the future, such as Central Park or lower Manhattan. If Ubisoft can make those areas unique compared to what you get with the retail purchase, they may have some great hooks for bringing players back. New York City looks great and every little detail is interesting. One final note is on the most interesting aspect of the game: The Dark Zone. Unless you are in the safe-zones (player hubs) or in a co-op party, you won’t run into other players in the city. The Dark Zone, however, is open to PvP and PvE action. You’ll run into much tougher AI here, as well as have player encounters that have no scripted outcome. At any moment a human player can help or hurt you, and take your loot if you happen to die. The risk/reward in the Dark Zone is high though, as the best loot can be found there. It carries a distinct sense of anxiety with it, and players will no doubt use this area and its “no rules” mindset for some awesome experiences in the months and years to come. If you like the sort of experience a MMO-light game can provide, this game is definitely for you. You can largely ignore any sort of online interaction if you want, and it still plays like a solid single-player RPG experience with its story elements and general pleasant game-play loop. I can’t wait to see what elseUbisoft brings to the title to keep players invested. I hope they add some things like vehicles for better traversal instead of having players rely on the cheap fast-travel system. The city they created is so interesting, and I hate traveling around via the map when I could instead check out all the detail on my way from point to point. That gripe aside, I found it considerably more re-playable than most MMO-light games that have hit in the last few years, and highly recommend tackling the game’s story and Dark Zone with friends for maximum enjoyment. Follow LevelSave for Live Updates from the PAX East 2016 Floor! How would vehicles move around the city with so many roads blocked by vehicles that would not have room to let a vehicle pass (I ask this as it’s the same thing I thought about, having vehicles :D).